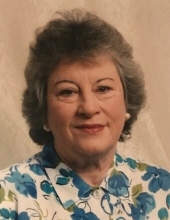 Margaret E. McCord, 87, of Chesterfield, Virginia went to be with her Lord April 3, 2019. She is survived by 3 sons and 2 daughters: Michael G. McCord, David W. McCord, Beth A. McCord of Chesterfield, Virginia, James H. (wife Debbie) McCord of Powhatan, Virginia, Theresa A. (husband James *Smitty*) Smith of Anderson, Indiana. 14 grandchildren: Todd (wife Michelle) Barrett, Scott Slocum, Jami Carandang, Robert (wife Wendy), Summer, Christy, and Cody Sellers, Marie (husband Stacey) Wilbourne, Brandon Meyer, Maggie, David, and James McCord, Luke (wife Jenna) McCord, Jonathan (wife Jenni) McCord, 29 great grandchildren, 1 great great grandchild, many nieces and nephews, and devoted friend and like son, Henry. She was preceded in death by her mother and father Grethel Freelove and Robert L. *Lefty* Kellams, husbands Earl Jackson, and Donald E. McCord, daughter Donna L. Sellers, grandson Donny Sellers, brother George Kellams, sister Marsha Kellams Jones, and grandparents Joseph & Annie Smith. The family will receive friends Wednesday, April 10, 2019, from 1pm to 2pm at Bennett & Barden Funeral Home, 3215 Anderson Hwy. (Rt.60), Powhatan, Virginia, with funeral services following at 2pm. Interment services will be in Anderson, Indiana. To send flowers or a remembrance gift to the family of Margaret E. McCord, please visit our Tribute Store. "Email Address" would like to share the life celebration of Margaret E. McCord. Click on the "link" to go to share a favorite memory or leave a condolence message for the family.